I hope everyone had a wonderful Father's Day with their dads! My husband and I actually spent father's day with my dad the weekend prior and then his dad this past Saturday. Worked out perfect and other than the pouring rain this past Saturday night, both days with our dads was great. I took some time Saturday morning to take some pictures of finished jewelry and was able to get one beaded bracelet posted. I'm a perfectionist and taking pictures of jewelry has always been the one thing that is never perfect for me. Although I'm kinda likin' the black background -it just doesn't work with all of the jewelry. Sometimes you just gotta have a white background to showcase how beautiful the beads are! 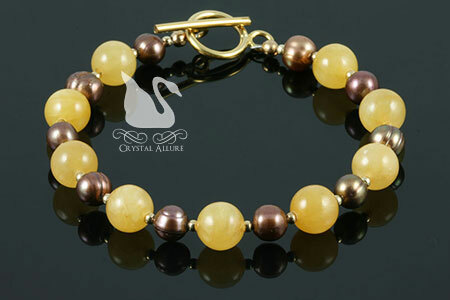 But for now, here is the Bronze Pearl Honey Jade Gemstone Beaded Bracelet (B128). 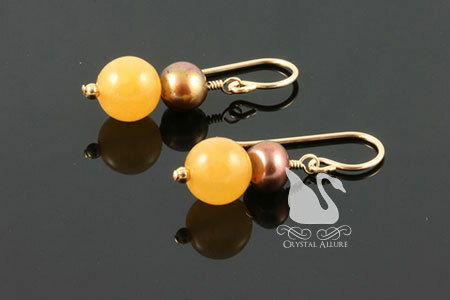 An alluring combination of chocolate-y freshwater pearls and warm honey jade gemstones, all accented with 14 karat gold filled beads and toggle clasp. Measures 7-1/2". To match your bracelet why not try the matching earrings. Enjoy and stay tuned for more new jewelry!